Click here for sample verses from the version by Matthias F. Wahba. Contents: Coptic Prayer Book of Hours • 77 Psalms, numbered acc. to the LXX • some NT– texts. Comments: Softcover octavo, sewn binding; XII & 368 pp. ; Scripture texts in parallel column, left side English, right Arabic; numbering of Psalms follows the Coptic version. 140 • 141 • 142 • 145 • 146 • 147. Mat. 5:1–16 • 6:9–13 • 25:1–13 • Luk 2:25–32 • 4:38–41 • 7:36–50 • 9:10–17 • 12:32–64 • John 6:15–23 • 14:26 – 16:4 • Eph 4:1–5. The Bibliography on p. II refers to + The Agpeya, in Coptic and Arabic, Cairo 1975 + The Book of the Psalms of David the Prophet, in Coptic and Arabic, Cairo 1897, reprinted by Dr. Shaker B. Mikhael + (…) + The Septuagint Version of the Old Testament, ed. Charles L. Brenton, 1978. Whether the Biblical texts have been revised or not since the 1st ed. of c. 1984, is not known. The Preface doesn´t comment on that. 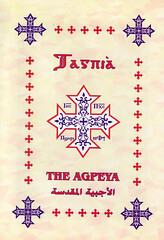 This prayer book is also available in English only.